The World Barista Championship Apron has arrived! Made from a heavy weight cotton and featuring 3 large "handy" pockets, perfect for all your barista needs. Adjustable neck and waist straps means this apron fits everyone perfectly, no matter how tall or short you are. The brass buckle on the neck strap adds an industrial look and compliments the gun metal grey colour. 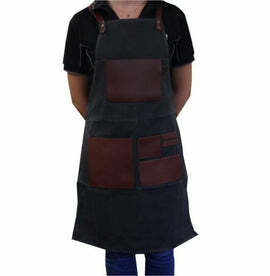 This apron will protect your clothes from the day to day wear and tear that comes with working as a barista.